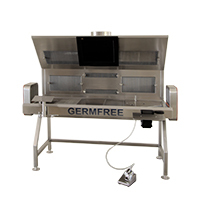 Germfree manufactures Downdraft Tables for a range of pathology work in an open source area. We specialize in energy-saving workstations that have minimal exhaust CFM requirements. Our units are constructed of stainless steel and are designed to be easily cleaned and decontaminated. 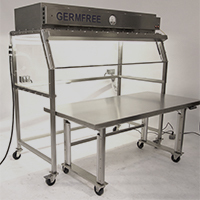 Germfree’s Downdraft Tables are ventilated workstations that are specifically designed for many procedures in pathology/histopathology labs and animal research facilities. The Ventilated Workstation (VWS) was developed by the Global Laboratory Initiative working group of the Stop TB Partnership, WHO, the Union, FIND, CDC, GERMFREE and other partner organizations. The Ventilated Workstation is designed for AFB-smear microscopy in developing regions, and is the result of this comprehensive public and private cooperation in solving an important global health concern. The Compounding Safety Enclosure will provide the operator with maximum protection while weighing and transferring non-sterile powders and compounds. The unit consists of a main work area with one (CSES) or two (CSED) large hinged windows for the ingress and egress of large pieces of equipment. Pre-filters are located above the work area and swing down for easy replacement. The pre-filters aid in extending HEPA filter life by removing large particles. The CSE draws air in over the sash opening, then up through the filters, providing a wash of particulate laden air away from the user. 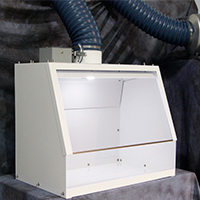 All CSE Safety Enclosures are constructed from high quality stainless steel and acrylic. The stainless steel surfaces inside the hood are impervious to most chemicals and are easily cleaned. All CSE models provide a safe environment for your facility, they are also dependable, low maintenance, and very cost effective to operate.